Please refer to the lucy® size chart for optimal fit and sizing. 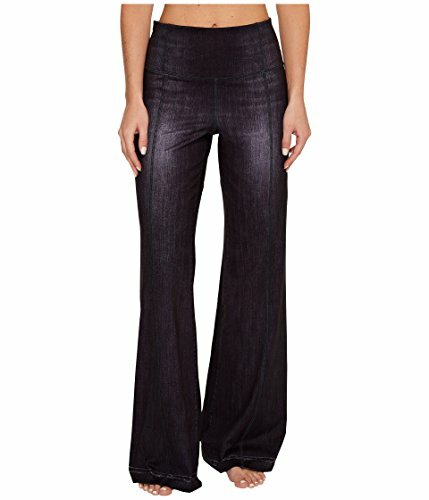 lucy Apparel Size Guide Get in touch with your inner yogi with this lucy® Indigo Flare Pants! lucy® tech™fabric wicks away moisture to promote a dry and comfortable personal climate. Figure-enhancing shading creates a custom fit. High-waist band slims hips. Zipper opening at side. Wide flared cuffs. 88% polyester, 12% spandex.Lining: 100% polyester. Machine wash, tumble dry. Imported. Measurements: Waist Measurement: 27 in Outseam: 41 in Inseam: 32 in Front Rise: 10 in Back Rise: 14 in Leg Opening: 23 in Product measurements were taken using size SM, inseam 32. Please note that measurements may vary by size. Figure-enhancing shading creates a custom fit. High-waist band slims hips. Zipper opening at side. Wide flared cuffs. 88% polyester, 12% spandex.Lining: 100% polyester. Machine wash, tumble dry. Imported. Measurements: Waist Measurement: 27 in Outseam: 41 in Inseam: 32 in Front Rise: 10 in Back Rise: 14 in Leg Opening: 23 in Product measurements were taken using size SM, inseam 32. Please note that measurements may vary by size. If you have any questions about this product by Lucy, contact us by completing and submitting the form below. If you are looking for a specif part number, please include it with your message.